Why does it take so long to make Katz and the others face justice…? Petty shoplifters are arrested on the spot, and are being prosecuted to the full extent of the law. There isn’t really any Pro Bono legal work done in Winnipeg. And divorce lawyers can be particularly costly. And this is probably why Katz felt compelled to steal. I used to be very close with Katz. I was helping him carry the bags of money to the car, daily. In return he arranged for a parking spot for me, right in front of city hall’s door. I also got a nice bonus when resigning. 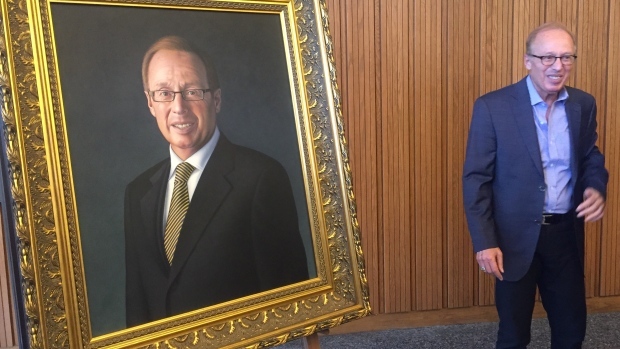 In a city such as Winnipeg, a portrait of the late, down-to-earth, Brian Sinclair would have been much more appropriate. When a lawyer I never had the pleasure of representing this late Brian Sinclair. Can not be held against you, Howie. Everybody knows that you have done a lot of good in your time as lawyer. If asked by Katz himself, I would have paint this portrait for much less! Looks more like a creepy clown than like a mobster. Unlikely us Jared, Katz is a self-made man. I tried real hard and couldn’t see anything.